If you're looking to add a beautifully clear, glossy, UV stable coating to your artwork, photos or other creative projects then world-renowned ArtResin® offers unsurpassed performance coupled with incredible ease-of-use for perfect results, every time. 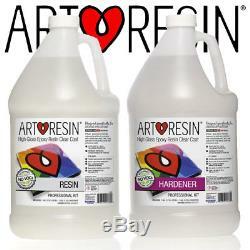 ArtResin is a two-part epoxy resin with an easy 1:1 mix ratio by volume. Its unique formulation means that the resin self-levels to form a perfectly flat, super-shiny finish free of any surface imperfections (sometimes known as blush) or trapped air. If any air bubbles do appear, a light breath over the piece is usually all that's required to release them. Once cured, ArtResin® provides a super-clear, semi-flexible coating that won't shrink, distort or yellow over time. ArtResin® uses a simple 1:1 mix ratio by volume. Mix as much resin as you need by measuring out equal parts of resin and hardener and then combining them carefully and thoroughly for several minutes. Once mixed, ArtResin® can be poured over many types of artwork, photographs, stickers, badges and much more. For detailed answers to hundreds of questions about how to use ArtResin® view the ArtResin® Frequently Asked Questions on the ArtResin website. Full details on all the amazing ways that ArtResin® can be used, along with a huge selection of inspiring tutorial videos and galleries can be found on the official ArtResin® website. ArtResin® was designed by artists, for artists and as such the number one priority was always to ensure that ArtResin®looks as good in years to come as it does when you first pour it. To achieve this, ArtResin uses advanced resin technology including extremely efficient light stabilisers allowing ArtResin® to start clear and stay clear for as long as possible. Uniquely, ArtResin® is certified'non-toxic' when used as directed. It conforms to ASTM D4236 which is a US certification meaning that it is safe for home use. It contains no solvents, produces no VOCs or fumes and is non-flammable. Although ArtResin® is non-toxic, you should still always follow common sense safety precautions; wearing gloves and work in a well ventilated area. For detailed health information, please see the ArtResin® SDS on the ArtResin website. ArtResin® makes things look fantastic. A perfect, super shiny finish can transform watercolours, oils, mixed media, photographs, child masterpieces, in fact just about any creative project, in new exciting ways. Once you start to experiment with ArtResin® on your artwork or craft projects, the only limit is your imagination and if you're a professional artist or art print business, you'll find that ArtResin® can significantly increase the value of your work. 7.52L (2 gal) Professional Kit - Coverage. ArtResin® is available in a range of pack sizes. The listing on this page is for a 7.52L'Professional Kit' which includes enough ArtResin® to cover an area of approximately 6sqm (64 square feet). The exact amount of resin you will need will depend on how thick you want your glossy resin coating and the type of media you are covering. The ArtResin® name, brand and artwork are used with kind permission from ArtResin Inc. The item "ArtResin Clear Epoxy Coating Art Resin for Artwork and Photos 7.52L Pro Kit" is in sale since Tuesday, November 07, 2017. This item is in the category "Crafts\Art Supplies\Other Art Supplies". The seller is "artresinseu" and is located in Stoke on Trent, Staffordshire. This item can be shipped to all countries in Europe.